New Barbie: Remember the Aqua song ‘Barbie Girl?’ Well even Barbie wouldn’t fit into her world anymore because gone is the blonde bimbo girl (aqua’s words, not mine,) and instead a new breed of Barbie is headed to toy shops. Creators of new Barbie Mattel are finally getting with the programme and have introduced a line up of individually sassy girls, you can expect to see 3 new body types: petite, tall and curvy, which as a Barbie fan still to this day (I got a Barbie doll for my 21st birthday and I ain’t ashamed to say it, although I have no idea where it is now and my birthday was Barbie themed, so quieten down.) My confessions is, that at first reveal I found the different looking dolls surreal, but this isn’t to say I wasn’t mega pleased for the new adaptations, which is basically 16 years late but better late than never right? I had a feeling of guilt for not wanting to do a Tom Cruise sofa jump, over the exterior of the dolls because I felt I should have appeared that way. 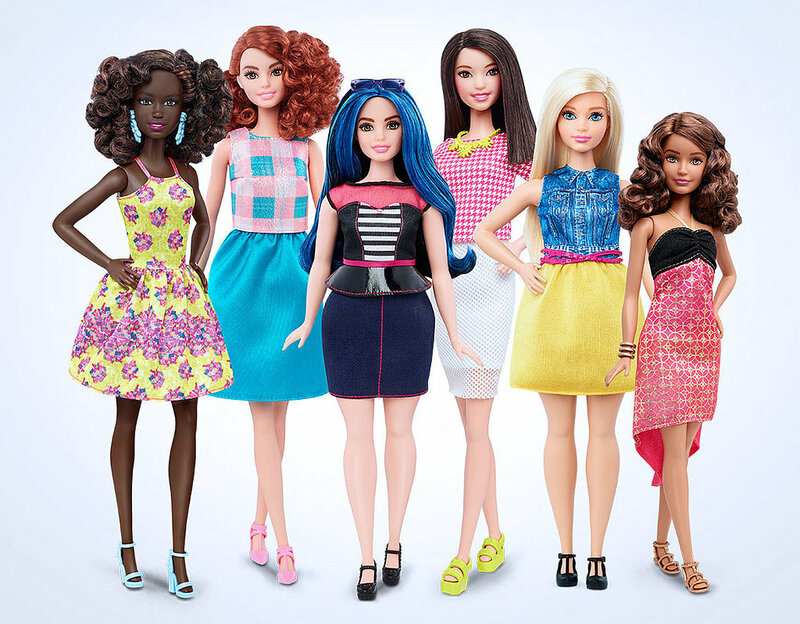 I adored the ideology and the message the new addition dolls sent out but I guess I love and hold original barbie close to my heart, and I don’t think it’s done me any harm for having played with the unrealistically proportioned figurine. Regardless of the up until now uninterested reboot of the 1959 born toy, the toymakers should be applauded for taking cultural changes and widened beauty standards into consideration, over gender based stereotypes. The Simpsons’ Lisa Simpson would be grapevining across her bedroom, saxophone humming but it interests me to picture how fictional character Smithers would react to this upheaval. Let’s go back and explore my initial happy but not overwhelmed reaction to the reveal of the new Barbie’s, I could muster that perhaps I found the dolls less desirable because to me they didn’t scream glamour but that wasn’t down to their thicker or more athletic physiques, I think it could have just been down to their choice of outfits. Truth be told that on first inspection, a plus sized barbie looked like actress Gwyneth Paltrow in Shallow Hall (ok ok she isn’t clinically obese but it’s not the Barbie norm so looked bizarre at first glance,) petite ones looked like young teens and an extremely lithe Barbie looked like Hunger Games’ Jennifer Lawrence. I love the normalisation of all these varied sizes even if doesn’t seem it and I feel it would at first be more encouraged by the parents to buy, rather than the child themselves but maybe I’m wrong. In a world where children as young as 5 years old are adamant they were born into the wrong body, where young children have eating disorders and low self esteem. It’s essential to teach the next generation of Barbie owners that looking different isn’t a travesty but a gift. I came from the generation of Barbie girls’ that played with predominantly white dolls yet we were being taught that new Barbie didn’t have to use her body to get somewhere in life. 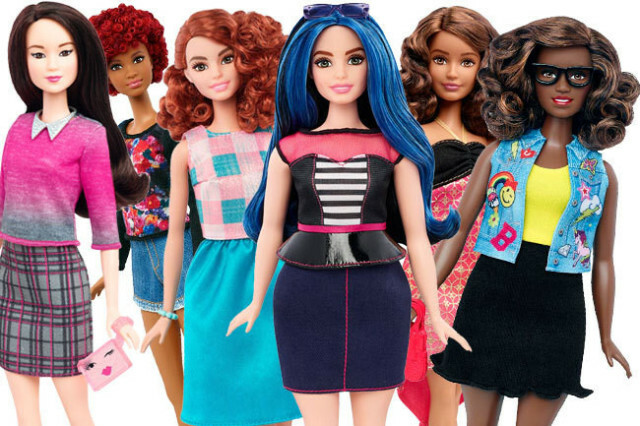 Vet Barbie, Doctor Barbie and Teacher Barbie, we were being taught to have ambition and flair at the same time, so now in 2016 new Barbie girls and more than likely boys are being taught exactly the same, plus some. As more actions present themselves, I think we could expect to see Barbie in a wheelchair, Ken with an amputated arm and Bratz with walking sticks or guide dogs… and at first glance people may be happy but taken aback just like I was today but they’ll realise just how far we’ve come. Originally posted on January 29, 2016.